Cover of booklet for “Georgia Harmonies: Celebrating Georgia Roots Music,” 2012. Booklet designed by Debby Holcombe. Image courtesy of the Center for Public History, University of West Georgia. On Saturday I organized a Sacred Harp singing for the concluding event of the touring exhibition, a day-long “Georgia Roots Music Festival” at the Woodruff Arts Center in downtown Atlanta. After an introduction by Jared Wright of the Center for Public History at the University of West Georgia, I taught a brief singing school, which led into an hour-long singing. Thirty-five Sacred Harp singers from across Georgia (with a little help from Tennessee) were joined by over one hundred festival attendees for what turned out to be quite a strong singing. Micah Roberts leads during the Sacred Harp singing at the Georgia Roots Music Festival, Woodruff Arts Center, Atlanta, Georgia, January 18, 2014. Photograph by Sam Culpepper. Jesse P. Karlsberg and Lauren Bock teach a singing school at Long Cane Baptist Church, near LaGrange, Georgia, October 27, 2014. Photograph by Ann Gray. 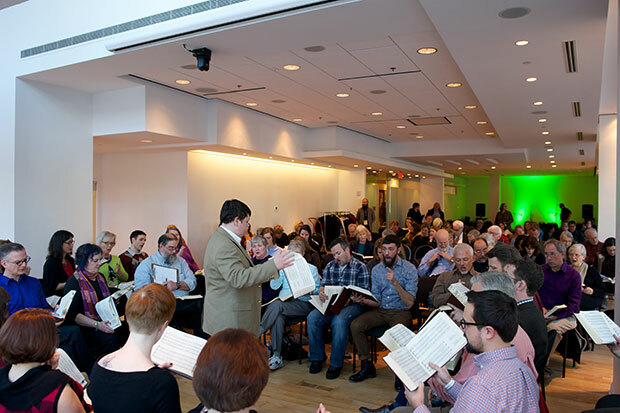 In addition to introducing Sacred Harp singing to Georgians across the state, “Georgia Harmonies” events proved engaging to the Sacred Harp singers who participated. As I wrote for the Southern Spaces Blog, the events led white Sacred Harp singers “to meet, share histories, and compare and contrast our musical practices” with participants in the a black shape-note gospel singing style called “note singing.” Exhibition events also brought singers to locations with historical or civic importance, ranging from the Woodruff Arts Center (Atlanta’s premier arts institution) to the Long Cane Baptist Church near LaGrange (which J. L. White identified in 1920 as the site of the first Sacred Harp convention in 1845), where Lauren Bock and I taught a singing school in conjunction with another of the exhibition’s stops.